GlobeFeed.com site contains various online application, mashups that may help you in your day-to-day life. For example, our distance calculator can help travel enthusiast to find distance between two cities. Also our easy-to-use online metric conversion calculator can help users to convert common measurement units. Below is the list of the applications that you may find usefull. Distance Calculator is an online application where user can find the distance between two cities, towns or airports. The distance calculator application is available country-specific as well as world-wide. 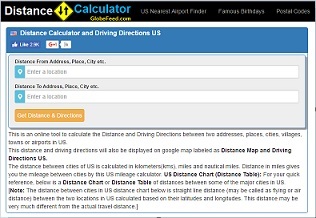 For example, You can find the driving distance and directions between cities and places in the United States using, US Distance Calculator. The travel enthusiasts may find this application helpful to get the idea of the various routes, driving distance and driving directions. Also the application displays the distance on the Google Maps to get better idea about the locations and the distance between them. For most of the countries, route options, driving distance as well as driving directions between the cities are also shown on the Map. Metric Unit Conversion Calculator is a set of online unit conversion calculators. Many times we need to convert one form of unit into another. Our unit conversion calculators may help you achieve the same thing online. The interface of the application is very easy to use and you can get the results very quickly. Metric Conversion Table is also available. Currently the set includes conversion calculators for commonly used units of weight, volume, length and temperature. We will try to keep adding more to the list. Nearest Airport Finder is an online application which helps user to find out airports which are near to a city, town or village. The list of top ten nearest airports from the entered city is displayed with their straight line distance from the city. The list displays name of the airport along with its code. The travelers who are planning to travel by air, may find this "online airport finder" useful to get the list of nearest airports. The location of the airports is also displayed on the Google Map. This gives better picture of the result.